The world’s best-selling e-readers, Kindle & Kindle Paperwhite, and Kindle Fire HD 7.0” and HD 8.9” are available in India now officially. The 5th generation Kindle, the smallest and lightest Kindle ever and top-of-the-line Kindle Paperwhite, both Wi-Fi only and Wi-Fi + 3G models, will be available for purchase at suggested retail prices of ₹5,999, ₹10999 and ₹13999 respectively on June 27th, 2013 on www.amazon.in from Croma. Kindle Paperwhite has 62% more pixels and 25% increased contrast compared to the previous generation Kindle; an innovative built-in front light for reading in all lighting conditions; up to 8 weeks of battery life and a thin and light design. Likewise the tablets, Kindle Fire 7” and Kindle Fire 8.9”, with a stunning custom HD display, built-in dual-band and dual-antenna Wi-Fi, perfect for web browsing and streaming, apps, games and books, will also be available on Amazon.in starting June 27th 2013, at a suggested retail price of ₹15999 and ₹21999 respectively. It’s not just the hardware but the content and the world class customer service from Amazon that these brings these products alive in the hands of our consumers. The India Kindle Store offers the largest selection of more than 1.7 million books priced in Indian Rupees (INR) and of these more than 325,000 books are exclusive to the Kindle Store. Included in this are 82 of 100 Nielsen India Bookscan Best Sellers, illustrated content including graphic novels such as Judge Dredd , Batman and Watchmen, Children’s titles such as the Mr Men series and a massive selection of titles including new releases and works from a range of famous Indian authors like Amish Tripathi, Dr. APJ Abdul Kalam, Robin Sharma, Rashmi Bansal and Chetan Bhagat. Readers will also find over 325,000 Kindle-exclusive titles that they won't find anywhere else, including books by best selling authors such as Anuj Dhar, Kurt Vonnegut, Stephen Covey, Andy Borowitz, and Karen McQuestion, available to download and read on Kindle. Buy Once, Read Everywhere through the free Kindle reading apps that are available for all of the popular devices and platforms including iPhone, iPad, Android phones, Android tablets, PC and Mac. Amazon’s Whispersync technology will automatically synchronize the Kindle library, as well as notes, highlights and last page read across all of the Kindle devices and Kindle apps. Additionally, Amazon digital content is automatically backed up for free in the Amazon Cloud's Worry-Free Archive where it's available anytime. To celebrate the launch in India, starting today and for the next two weeks, customers in India will receive one best-selling Kindle Book each day for free. 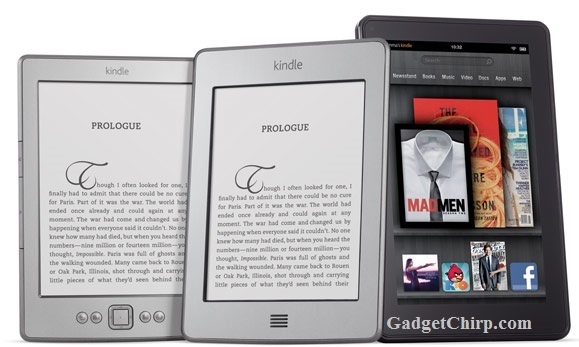 Kindle E-readers and tablets are also available at over one hundred retail outlets including Croma, Reliance Digital, E-Zone and Vijay Sales in major cities such as Mumbai, Delhi, Chennai, Bangalore, Chandigarh, Gurgaon, Kolkata, Hyberabad, and Ahmedabad.